Oh, my my. 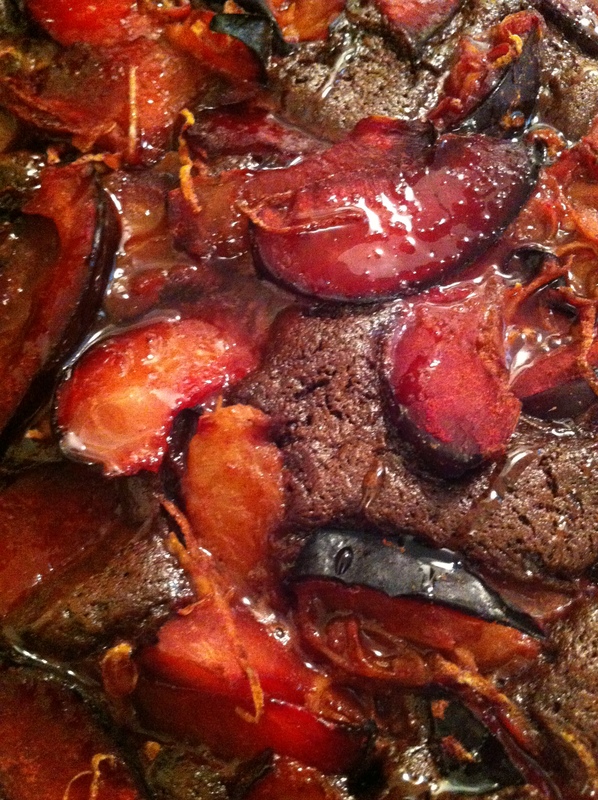 Feeling decadent and rich with a sack full of fragrant plums, I decided to experiment the other night. Chocolate and spice and everything nice – gluten free, dreamy…. 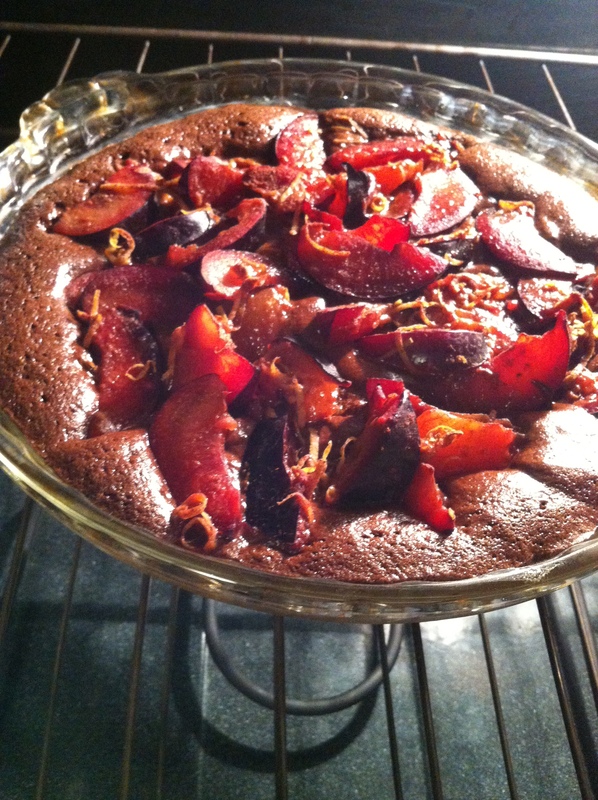 Summer is the time when you particularly get to choose to bake – or if you are attending family reunions, perhaps get to partake – of the colorfully named versions of various fruit desserts. Is it a buckle, a crisp, cobbler, betty, clafouti, crumble, pan dowdy, slump or grunt?? Based on what I know, I chose to call this version a buckle, although — it has a variant I hope will not disbar it from this particular family of the fruity dessert kingdom. No top crumbly layer, but rather a luscious spoon of whipped cream instead…. You know, I think that’ll be alright. Just fine. Do you agree? 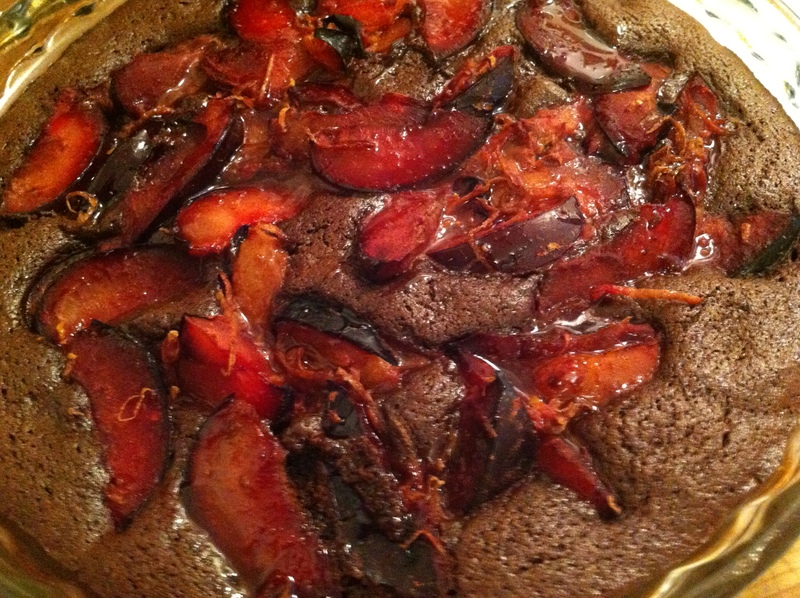 When making this buckle, or any summer fruit dessert for that matter, it is certain you will choose plums that “give” a little when squeezed, insuring perfect juiciness…. 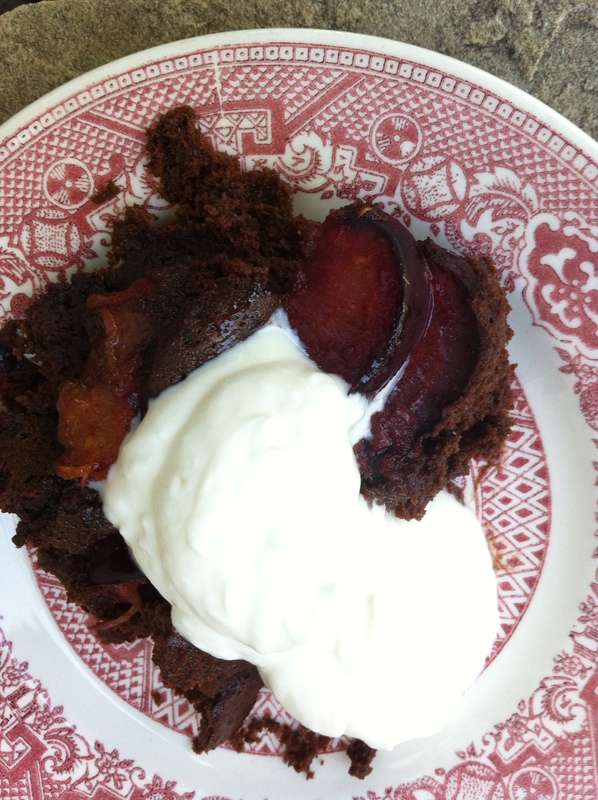 My hand shaky with delight, I snapped the next chocolatey photo — of the batter, left in eddies and waves to accommodate the tumble of spiced plums. Preheat oven to 350 degrees with rack in the center spot. Butter a 9 inch pie plate or other baking dish. 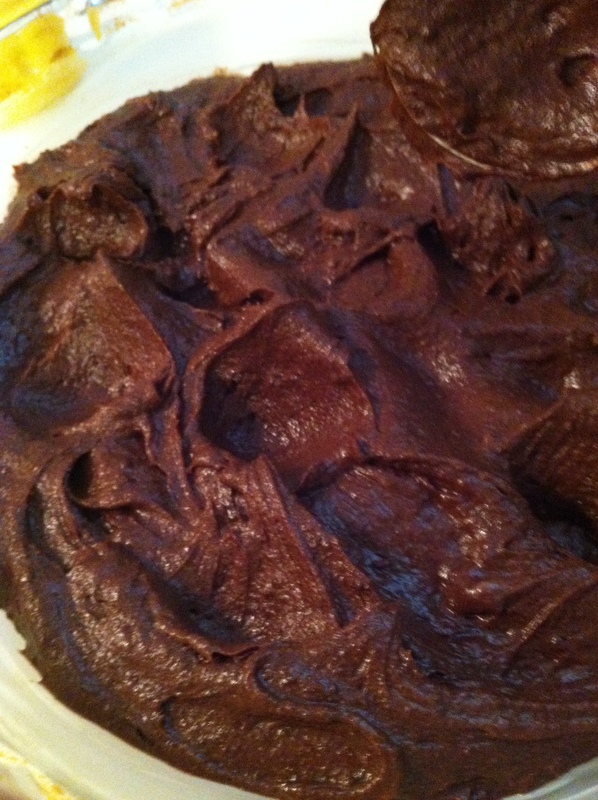 In a large bowl, cream butter with brown sugar, then add in cocoa – cream until smooth. 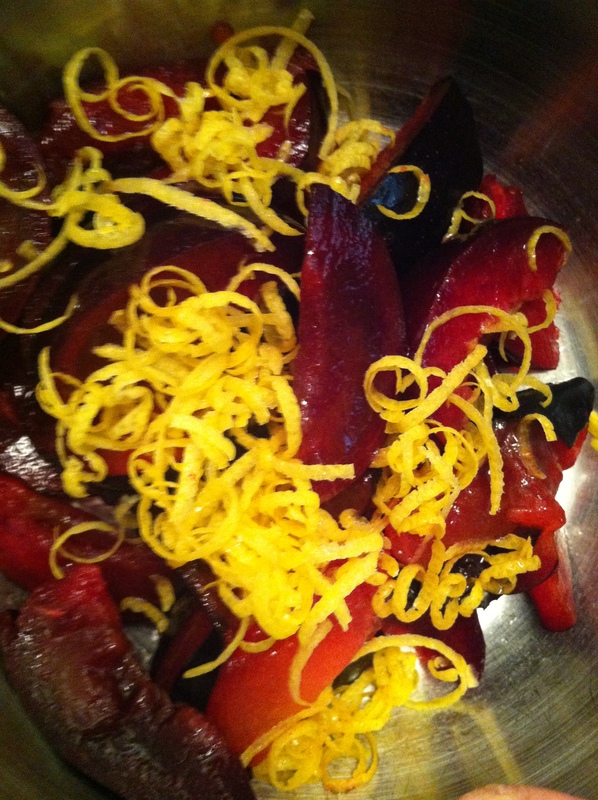 Whisk in the eggs and lemon juice, then add the dry ingredients. Fold into pie plate, and form “waves and eddies” with a spoon, dips into the surface rather than smoothing flat. It’s for fun! 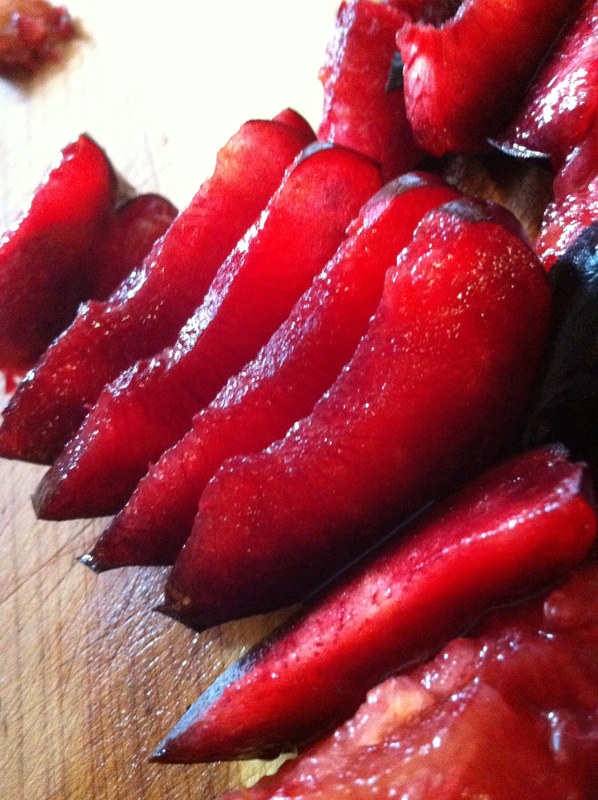 And for the plums to nestle in well…. 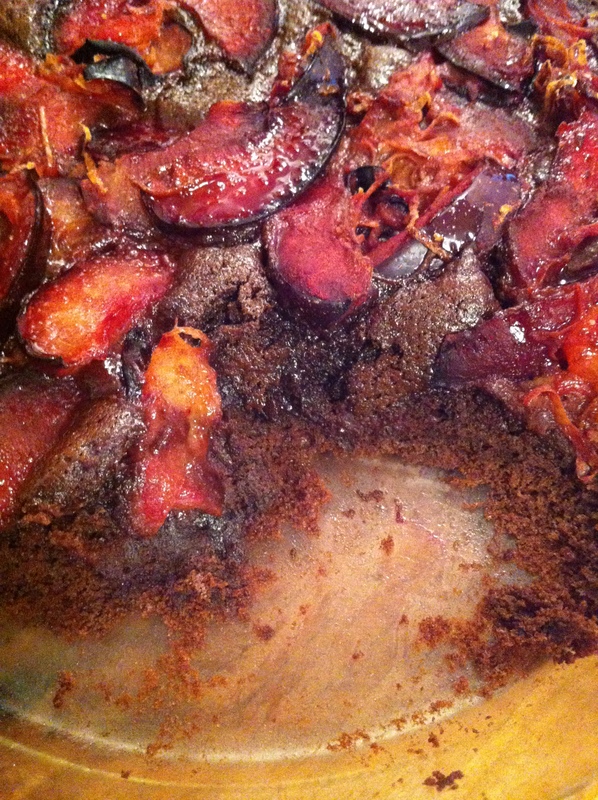 Evenly distribute the spiced plums over the batter. Bake for 25 minutes to a half hour, checking towards the end. The center should NOT be completely firm, on the other hand, the edges not browned. 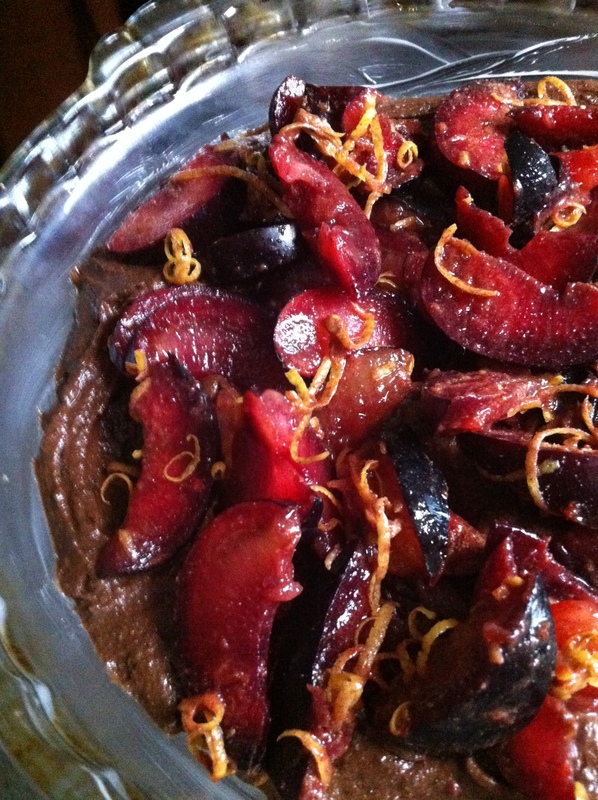 Brush the warm honey over the exposed plums as the buckle emerges from the oven. Whip cream in a chilled bowl until soft peaks form. Add honey and continue whipping until you’ve reached the stiff peak stage. Serve generous spoonfuls of the warm buckle with a good dollop of honey whipped cream, and smile…. Cheers, Roberta! Thank you for stopping by! I was hankering for some kind of wonderful chocolate! Oh, I can’t wait for plums to ripen here! This looks fabulous! Truly, Littlesundog, you cannot go wrong with this recipe if you have chocolate lovers at the table…!